We tend to read a lot about a set's design during preview weeks on dailymtg.com. Sometimes we get a bit of perspective during Head Designer Mark Rosewater's annual "State of Design" articles. What we rarely get to see is a sense of historical perspective applied to sets from years gone by. I'd like to examine some of the sets that were most influential, either through their successes or their failures, throughout Magic's history. I cheerfully admit that my criteria for inclusion are completely subjective. What I consider to be important developments will no doubt differ from everyone else. This is just a general overview; I will likely write more in-depth articles on specific sets at some point in the future. Obviously this list can only begin here. Richard Garfield and his many collaborators designed a game to appeal to the Dungeons & Dragons crowd which turned out to be as addictive as heroin and as expansible as a Lego set. Limited Edition featured a strong fantasy flavor and wildly divergent power levels between cards. 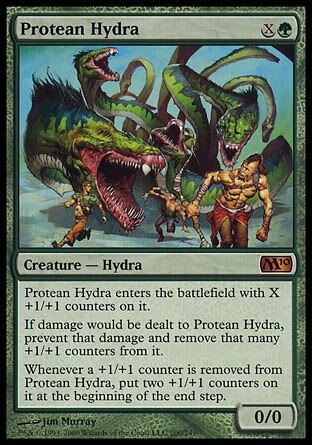 By giving the cards specific rather than generic names ("Serra Angel" instead of "Angel," "Rock Hydra" instead of "Hydra") the designers allowed plenty of room for new cards to be created within similar conceptual spaces. While Arabian Nights contained mechanical innovations that were echoed in future sets, the most important innovation was backward compatibility. Arabian Nights came very close to being printed with a different card-back than Limited Edition and Unlimited Edition cards. I don't think that Magic would be in print today if that had happened. Or at the very least the game would be far different from what we know today. While tribal cards such as Lord of Atlantis and Goblin King existed in sets as early as Alpha, the idea of an entire set devoted to tribal themes began in Fallen Empires. 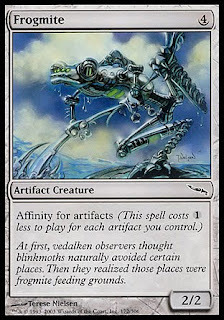 This kicked off a series of tribal sets over the years, with Morningtide being the most recent. While Legends was a large set, Ice Age was the first self-contained expansion set. Ice Age did not rely on cards from Fourth Edition (the current core set at the time of Ice Age's release) to create a playable deck; you could feasibly make a working deck exclusively from Ice Age cards. There were basic lands, reprints from Limited Edition with new art, functional reprints of Limited Edition cards, and cards which fulfilled a similar function be were different from Limited Edition Cards. In this way Ice Age set the stage for the modern block system. People had begun playing a little game-within-a-game called "booster draft" for some time, and R&D began specifically designing sets with drafting in mind with Mirage. There's no denying the tremendous influence Limited Magic has had on set design over the years. One effect of designing for Limited has been to control power creep and complexity creep. Only in the last few years, I think, has R&D considered complexity creep to be a major concern, but designing for Limited kept it mostly under control before R&D was particularly conscious of the problem. These sets contained a lot of degenerately powerful cards. So powerful that some of them were preemptively banned before the sets containing them were even released! You can bet that heads were rolling behind closed doors and it's clear that changes were instituted to help ensure that something like that wouldn't happen again. The massive rules overhaul that occurred when the Sixth Edition core set was released rationalized how the game's timing rules worked. There were rules changes before and there have been more since, but none so radical. The rules we play by today are essentially the same as were introduced in 1999. Entire card types (interrupts and mana sources) were eliminated and others were changed. While this was more of a Rules Management landmark than a Design landmark, there's no question that the Sixth Edition rules had a great effect on Magic design. Just as Fallen Empires was the prototype for a series of tribal sets, Invasion was the (rather more successful) template for a series of multicolor sets. By default, Magic is structured in such a way that it is easiest and most efficient to play a single color. The color pie, by making some abilities unavailable to some colors, encourages players to play more than one color. Multicolor sets like Invasion and its offspring (most recently, Alara Reborn) have tools to make it much easier for players to play multiple colors in a single deck. This block was the high water mark for board complexity in Magic. The Threshold mechanic combined with multiple discard outlets, plus the Madness mechanic, made evaluating board states nigh impossible. My understanding is that sets from this period were very mechanically-driven; the set was designed and then simply handed off to the Creative department who were then expected to provide flavor through the use of card names, creature types, and art. There was none of the creative back-and-forth that occurs in today's design and development cycle. I'm not sure what to say about Mirrodin. On the one hand, the Affinity mechanic engendered a horribly degenerate environment that caused people to quit participating in organized play in droves. On the other hand, it was one of the best-selling sets of all time. My feeling is that the repercussions of Mirrodin block are still playing out. Obviously the lesson "watch out for degenerate mechanics!" 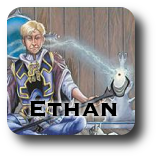 is one that's worth learning, but the answer to the question "why did Mirrodin sell so well?" is another thing entirely. Coming off of the too-powerful Mirrodin block, R&D over-corrected, making some of the following block's mechanics overly parasitic as a means of limiting their potential for abuse. The mechanics ("Splice onto Arcane" is the most egregious example) proved to be so parasitic that hardly anyone uses those cards for anything anymore. The lesson, "don't be too parasitic," is a good one, but some parasitism is necessary to distinguish blocks from each other. See my previous article for more details about parasitism. I consider Ravnica block to be the beginning of the modern design era. This is when R&D stopped designing sets and started designing blocks. Ravnica block is structured in such a way that it almost feels like one big set. Ten guilds, each represented by a color pair, four in the first set, three in each subsequent set. This was a watershed moment for Magic design. Let me start by saying that I love Time Spiral. It has a specific target audience, and I was a member of that audience. The set was one big in-joke, and those of us who "got it" had a blast. The rest of the Magic-playing world? Not so much. Even putting the limited-appeal theme aside, Time Spiral block had other problems. The block contained an absurd number of keyword mechanics which, even with reminder text included on the cards, took up a lot of head-space. Also, Time Spiral was the second-largest Magic set of all time (after Fifth Edition). This, coupled with the extra sets which were Standard-legal at the same time (Coldsnap and Eventide) meant that Standard's card pool was huge. This was a problem for a lot of players, too. The impact of all this was that set sizes became smaller, and themes were more universal going forward. Another design impact of the smaller set sizes was that R&D had to design much more tightly; there was no room for cards that were amusing but served no purpose any more. This set represents a major sea-change in how core sets were designed, and is also the fruit of a reappraisal of design priorities. M10 was the first core set since Beta to include cards that had never been printed before. This made the set much more appealing to experienced players. 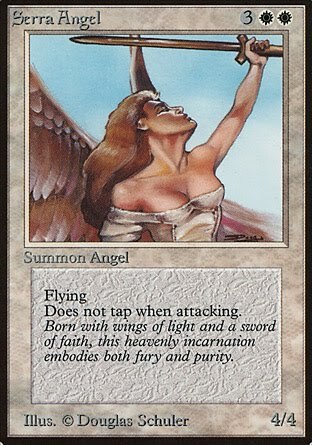 Also, the set eschewed storyline-specific cards in favor of resonant fantasy tropes. While most cards were simple, R&D didn't shy away from complex cards if they were "top-down" designs which evoke a recognizable fantasy creature or situation with their mechanics. Zendikar was a phenomenal success. Why? 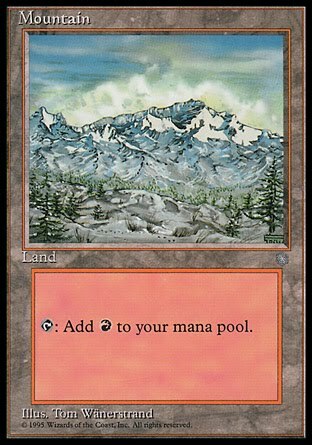 Was it because there were plentiful powerful rare cards with a proven track record, such as the fetch-land cycle? Was is because people liked the "Adventure World" flavor of Zendikar? Or was it because everyone wanted a chance to open a pack and find a Black Lotus inside for the first time since Unlimited went out of print? Rumblings coming from Wizards indicate that the powers that be would like R&D to design "more sets like Zendikar." Figuring out what that means exactly is beyond me at the moment, but I can almost guarantee that if I were to write another article like this five years from now, Zendikar would make the list. The only question is, "Why?" Interesting analysis! Since you list so many blocks, it's tempting to list the rest. Antiquities - artifact theme; Legends - multicolored cards, legends; Dark - color shifting; Homelands - keep power level up, don't leave long gaps between sets; Weatherlight/Tempest - coherent storyline; Masques - keyword upside mechanics; Onslaught - players like tribal; Lorwyn - tribal can be overdone, limit on-board complexity; Shadowmoor - hybrid as block theme, reduce number of unrelated mechanics; Alara - acquisition, mythics and set redesign; Eldrazi - huge creatures as theme. I think that the Mirrodin split between turning off players and selling well comes from the fact that it appealed to one set of players more than another. The players who liked it really liked it and bought in. The ones who didn't walked away. I honestly think the reason Zendikar did so well (after the treasures packs were gone) is as simple as not dropping the ball Magic 2010 passed to it. Zendikar's flavor was closer to standard Fantasy flavor than any Magic expansion and, at the end of the day, the folks who aren't already Magic fans vastly prefer the Fantasy they know to Magic's IP-biased spin.